R&D Fasteners, a privately owned business located in Rancho Cucamonga, CA, currently has 93-employees and was founded in 1984. R&D specializes in the manufacturing of specialty fasteners and hardware related items for customers in Aerospace, Industrial, Commercial, Marine, Waterworks, Heavy Equipment and the US Government sectors. R&D Fastener’s quality system is registered as ISO 9001:2000 and is in compliance with MIL-I-45208A. The management at R&D Fasteners wanted to increase the company’s sales in 2008. They hoped to retain sales and acquire new business by implementing Lean manufacturing methods to improve productivity. In addition, R&D Fasteners wanted to reduce set up times, minimize equipment downtime, lead times and work-in-process to improve on time delivery. They also wanted to improve scheduling support with training on its Made2Manage (M2M) Scheduling and Shop Floor Control system to better prioritize work. The project began in August, 2007 and had two objectives; 1) to develop the workforce skills in Lean manufacturing to improve productivity and; 2) to provide support assistance for its M2M Computer Scheduling software system. A Lean manufacturing program was developed to train and facilitate implementation of Lean principles with a 12-member “Lean Continuous Improvement Kaizen Team.” Improvement efforts were scheduled with the team once a week for 10 weeks. Current set-up processes were filmed and analyzed and the team brainstormed on how to reduce process inefficiencies. Facilitating 5S, a workplace organization methodology, helped to improve machine cleanliness and to organize the operator’s workplace. To support the second objective, weekly improvement efforts were held with production control personnel and other system users of the M2M system. The implementation team focused on how to improve communication and to coordinate shop activities with the M2M system. At the end of the project in June 2008, implementing Lean dramatically improved the organization and product flow on the shop floor. The Kaizen team applied “Cellular Manufacturing,” a model for efficient workplace design, to redesign the plant layout by grouping machines into manufacturing cells by product family. Depending on the product family, the Kaizen team’s activities achieved a 50% to 80% reduction in set-up times and proved to the team that the activities would result in significant cost savings and increased capacity in other areas. M2M training cleaned up floor control systems that provided inventory, routing and labor data being reported from the shop floor. Improved scheduling reduced WIP, new manufacturing orders were pulled only when the newly configured virtual cells needed work. 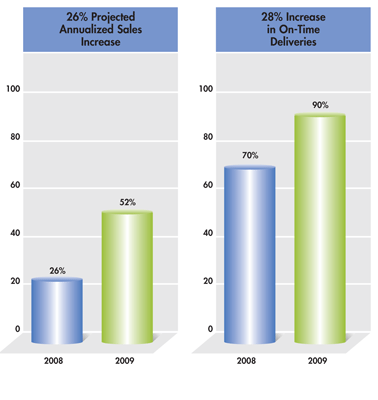 The reduction in WIP reduced throughput times and improved on-time delivery. In addition, a special work area was created for fastturnaround jobs. R&D Fasteners estimates that as the improvements spread throughout the facility, the increase in capacity and the reduced throughput time would allow them to increase sales by 26%. In addition, the following benefits could be expected within the first year: cost savings of 10%, on-time delivery improvement from 70% to 90% and Energy savings of $13,000. "We view CMTC as a partner of R&D Fasteners and value their ability to help us continually improve."